Home Healthy Feet Toe Pain? I'll start with a thank you! We can all get foreign objects in our feet, from small stones to shards of glass, and when you get something cutting into your foot, boy do you know about it with every step. I'll start by thanking my patient for giving me permission to use his photo of his toe for my website. I really enjoy seeing unusual cases that can show how podiatrists don't 'Just cut nails!'. The patient contacted me, as he had a sharp pain in his right 2nd toe. He felt it when he was catching it on the bed sheets, or in certain footwear. Corn or Verruca? I don't think so. On first view of the picture, and looking at the redness and swelling around what seemed to be a small black dot to the centre, I'm thinking this person has stood on something and it's gone into the toe. We exchanged a few emails and booked an appointment for the following day. As with all patients who visit me, I took a history of the patient's health and medication and then performed a health check on both his feet, as you can sometimes spot a potential problem which has not occured yet! Prevention is always better than cure! Once all this was done, it was time to tackle the problem in hand (or foot I should say!). The skin around the area was carefully reduced with a scalpel to allow the end of the object to be exposed at the surface. Then, using the scalpel the object was gently prized out of the toe, and placed on a cotton wood pad for inspection. The silver object is a size 3 scalpel handle, and the markings you can see are 1mm spaces. 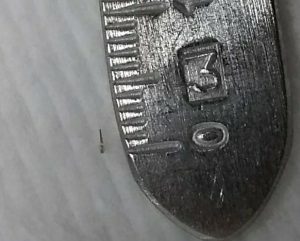 The object I removed is approximately 1.5mm long, and 1/4mm thick at most! I suspect it's a very fine thorn from a plant which has caught his toe whilst walking outside. Chatting to the patient futher, he did mention he had been walking across woodland with open-toe sandals on a few weeks ago, and can remember feeling something catch his toe at the time causing pain. Bingo! I had a similar case a few years ago, when a patient had been on holiday and stood on a sea anemone, and had over 25 spikes left in her foot, causing severe pain when putting pressure on her foot. It's strange how so much foot pain can be caused by something so small! What should I do if I'm getting foot pain? My best advise is to consult a podiatrist / chiropodist. We see plenty of different foot problems, and you'd be surprised how many are very easily resolved. It still amazes me how many people say "If I'd known it was that easy to treat, I'd have been here weeks ago!". 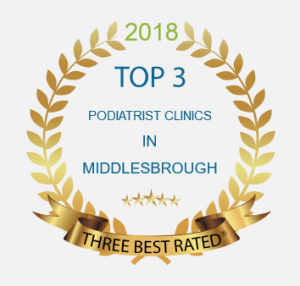 If you're not sure if your local friendly podiatrist can help you, ask for a call back, as I'm always happy to chat to someone before booking an appointment. Podiatrists / Chiropodists are the 'Foot Experts'. We are to feet, as dentists are to teeth. Foot Pain? Does the shoe fit?